We are now selling Amarino Nano 1.0 kit for Amarino experiments. 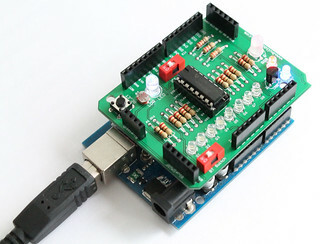 It is fully assembled kit and includes Arduino Nano and Bluetooth module. You can easily test RGB LED and sensor graph features of Amarino toolkit app. The shield is just a modification of previous shield designed and published by Sagar Sapkota (Buildcircuit.com). 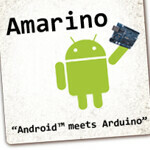 Amarino shield 3.0 has added one more header space for BlueSMiRF supporting altogether 3 different Bluetooth adapters. Provides space for BlueSMiRF mate silver and General Bluetooth adapter. You can also use other adapters, but you need to connect those using a breadboard and extra wires. Space for Bluetooth Mate Silver, Mate Gold, BlueSMiRF Silver – Supports 3 different Bluetooth adapters- NEW FREATURE!!! Switches for CD4094 and Bluetooth adapter- You can switch off CD4094 while experimenting with other components and program your Arduino with Bluetooth adapter still on the header- NEW FEATURE !!! Tested and verified at BuildCircuit.com Lab. See all the videos. 2x 1P DIP switch – The DIP switches can be used for switching ON/OFF Bluetooth adapter and CD4094 while uploading Arduino sketch and doing Amarino experiments respectively. a. General Bluetooth Adapter – Cheapest adapter available on www.buildcircuit.net. b. BlueSMiRF- Bluetooth Mate Silver – More expensive available on sparkfun.com. You ship “1 x Male header- 4 pin” but that is not seen on pic of final assembled board?? Any explanation of what this is for would be appreciated. The male header is just an option for connecting female wire.